Meditations on Montessori and Contemplations on Children. I am sharing my homework with you today. For way to many hours, I have been struggling with formatting a word document. It's just not my gift :-) and I am happy to own that. I decided to blog about my homework because the format is so much easier for me to use and well way more beautiful to look at. As I have mentioned recently, Melanie and I have been doing a Montessori course in the Arts for the last six weeks. Our final big assignment was to put together a unit on an Artist for our children to learn about. 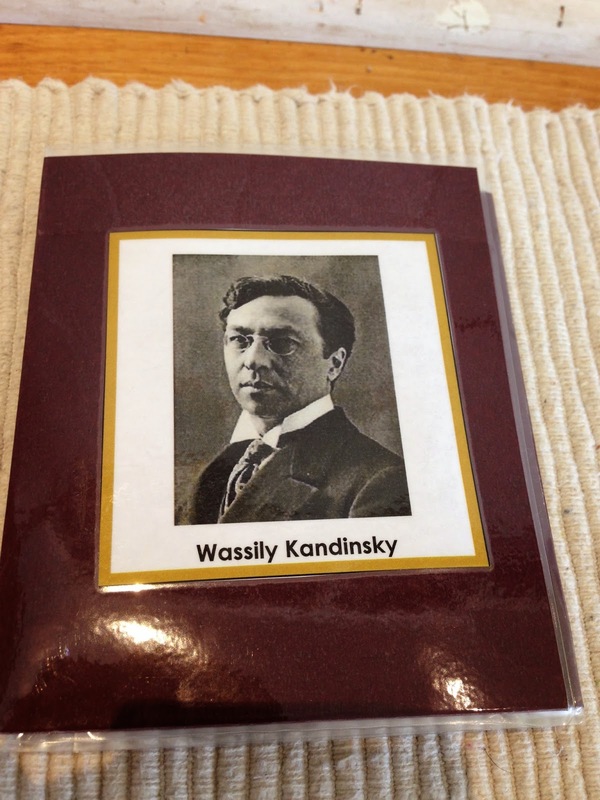 My artist study is on Wassily Kandinsky. I will post about Melanie's tomorrow! To start things off with the children I always love to read books about or based on the artist. The Noisy Paint Box takes care of that beautifully. The story is about Vasya Kandinsky a Russian boy learning about all things academic except his one true love, art. 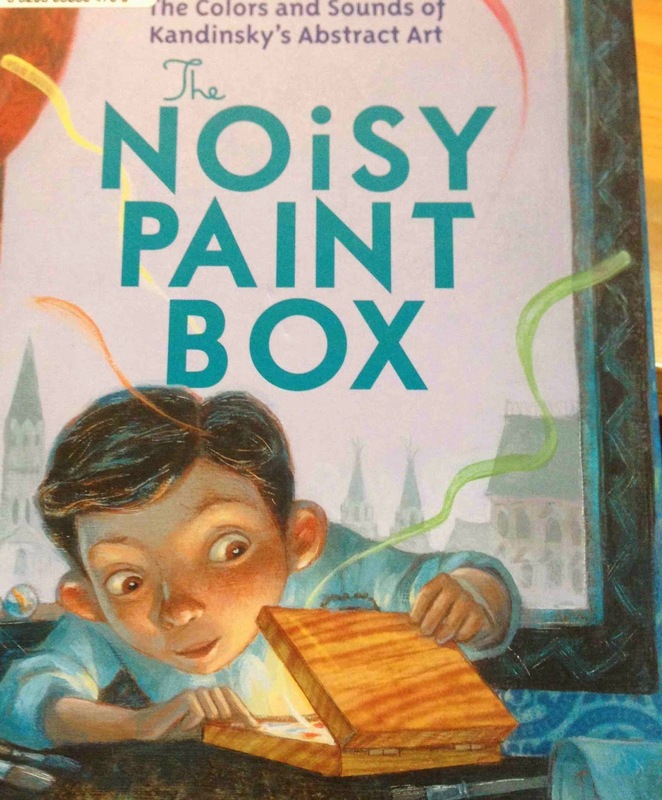 One day his aunt gives him a small paint box and so the adventure and the story begin for Vasya! It is a beautifully written and illustrated book by Barb Rosenstock. 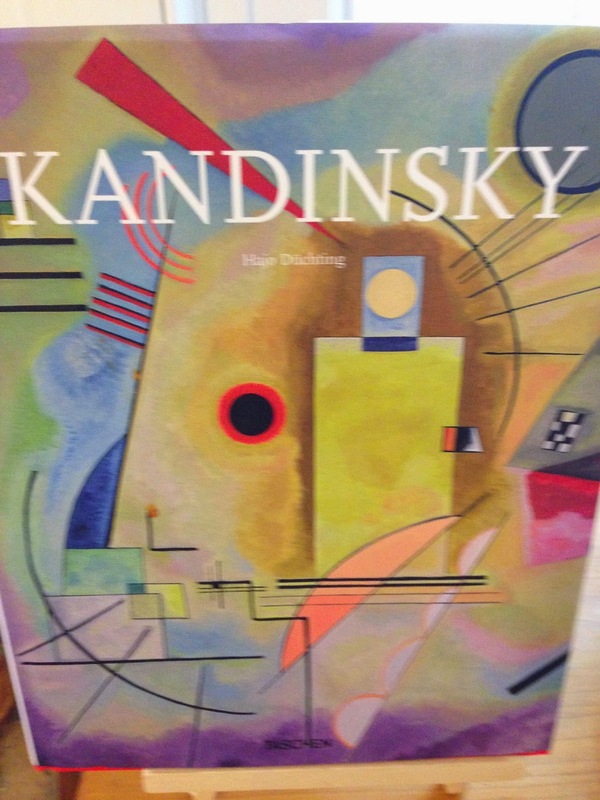 I also have a large art book on display about Kandinsky for the children to sit and look through. I have done this with several children in our classroom and they have enjoyed it immensely. It is a very lovely thing to sit with a child and have their complete attention. It is equally lovely to hear what they have to say about what they see and imagine they see. 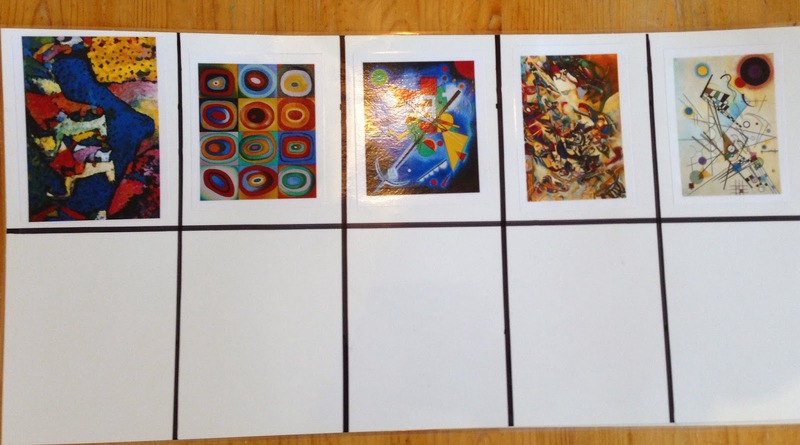 Another addition to our artist study were these three part art cards on Wassily Kandinsky that I made for the children to take out and match. This work was well received in the classroom and enjoyed by many children. I found the art cards at Montessori Printshop . It is a very small investment for such important work. I really appreciate that I can buy a PDF to print and make new cards when these ones get tired. There is also a a wonderful tutorial here on how to make the pouch that holds the cards. I did make a pouch from the tutorial and it works well enough but, I will likely make a new one out of fabric when this one need replacing. I think fabric will hold up much better be inviting to touch. 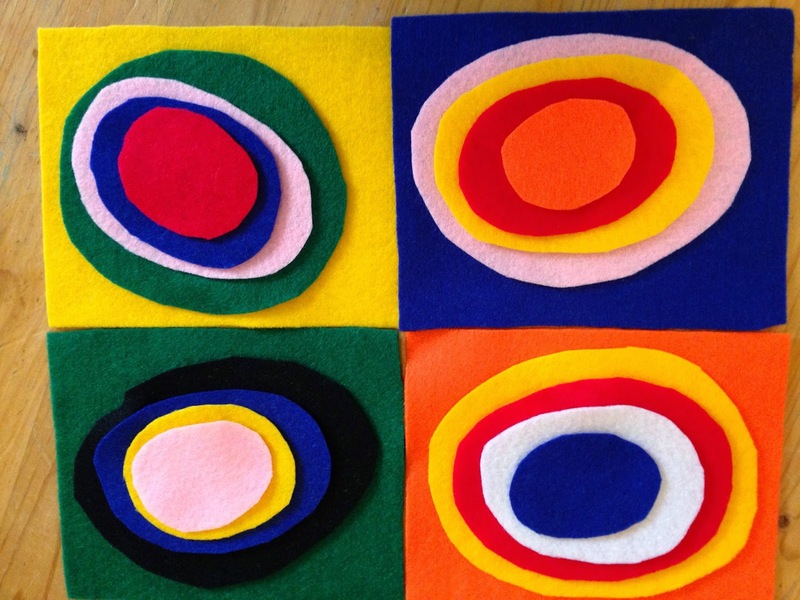 Another new piece of work I made to complement the artist cards, was a version of Concentric circles out of felt for the shelf. The children can take the basket out and make their own version with the felt pieces in the basket. I must confess, I love making new things for the classroom. It is one of my most favourite things to do. This particular piece of work is designed for every child. You don't have to have a good pincer grip to master this piece of work. I also made this lotto art game. The children match the master pieces to the control master piece already fixed on the work mat. I had all of this laminated so it would hold up and I glued CD pouches on the back of the work mat to hold the lose art cards for matching. This would be a great thing to make in different version based on other artists. 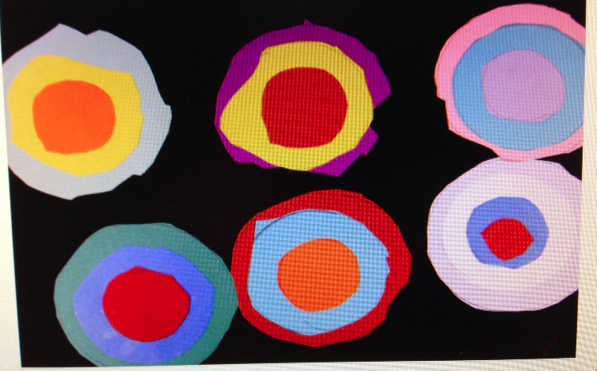 Next, we took the ideas of Wassily Kandinsky and implemented them through our own art projects. I love the way Kandinsky uses vibrant colour. I also really love his Concentric Circles so we used various circular things to make our own Concentric Circles. I set out paint and small plungers, glasses, carrots cut in half for stamping and potatoes. We also used some bingo daubers for really small circles. I also varied the types of paint we used. I wanted the picture to reflect both shiny and dull paint so the pictures would have some depth. The results are stunning not to mention the fact that the children absolutely LOVED Stamping. This art project was a big thumbs up! Some other ideas I have found and want to implement are 3D picture making with circles using recycled materials. This could be a large class project as a stand alone piece of art for the classroom. We may do this at our Art camp this Summer. I am thinking really big on this project. Sky is the limit right?!! 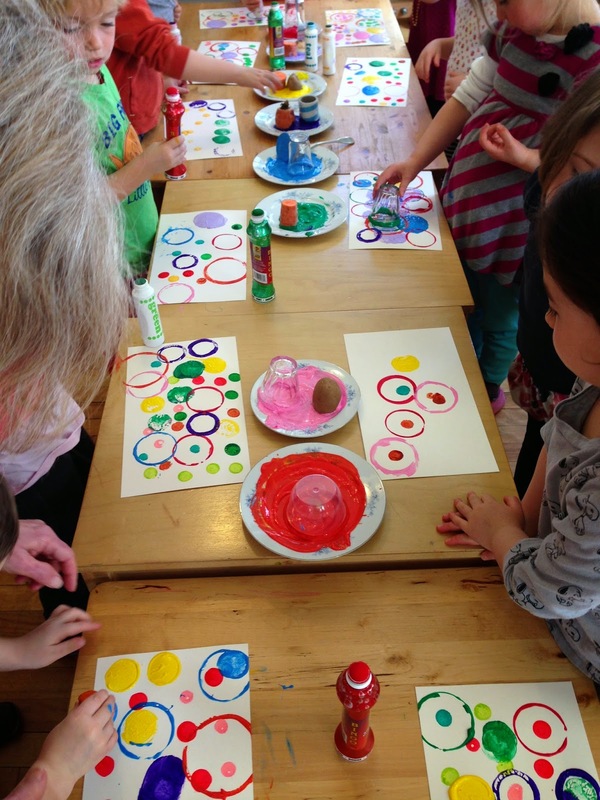 Finger painting the Colour Spectrum in a Circular design. This would be brilliant as an independent project on the art shelf with small pots of finger paint or water colour paint. You could even do it on a round paper plate. Here are some more projects I have filed away in my idea bank for our unit on Kandinsky. I envision this piece done with both pastels and water colour paint. It could be more structured with the use of the circle metal inset or very free form. Wouldn't this be brilliant as weaving work?! You could use streamers, yarn, roving and ribbon or all of them. Construction paper Circle. This would be brilliant as paper cutting and gluing work and then it could be made into a card. I love the idea of collaging with various colours and shades of tissue paper. Tracing circles. Metal insets anyone? The addition of chalk pastels, oil pastels or water colour paint would make this stunning. Not to mention that you could really define the dark out line of the circles. I like the idea of blowing dark brown paint on the paper with a straw to form the tree and have the children glue or paint circles on the branches. The circles could be from pin pushing work and used for the gluing portion of this project. More circles, I know... but I love the contrast of the black card stock that frames this piece, I envision this as cutting work or pin pushing and gluing. We are accepting Enrollment for 2019 now! Ms. Michelle is a mom to Daniel and Rachael and partner to Shawn. After studying Canadian Studies and Sociology at Mount Saint Vincent University for several years, she left her studies to follow her heart: she got married and started a Montessori diploma program. Ms. Michelle holds a diploma from the Montessori St. Nicholas training centre in England and is also trained in Early Childhood Education. After teaching Montessori in Ontario, she returned to her roots in Nova Scotia, where she started Maple Tree Montessori – out of the basement of her house. That was sixteen years ago. Ms. Michelle is also a certified Children's Yoga Instructor having completed the Radiant Child Program and is currently working on her 200 hr YTT. Maple Tree Montessori is, and always will be, a very special place for children.